As far back as I can remember, I have been restless. Spending time in one place for too long makes me edgy. It makes me wonder what else I could be experiencing. What am I missing? When I was younger, it was just the opposite. My Dad moved us frequently (I attended over 30 schools before graduation) and I hated it. I always wanted somewhere to be rooted, to call home. Now that I’m older and have two kids of my own, I want to give them the stability I never had. But I also want to give them a taste for the world. 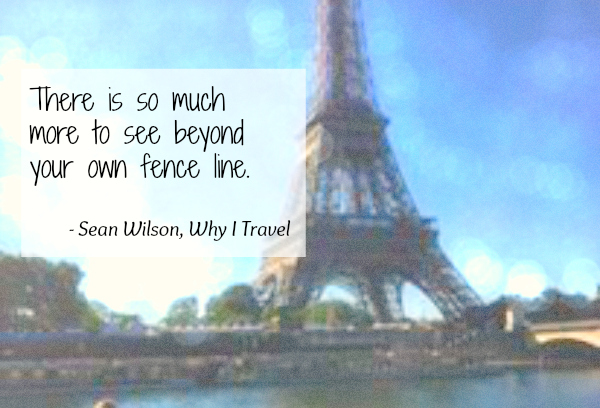 There is so much more to see beyond your own fence line. We have been very fortunate to visit some incredible places, Chuck and I. And since Ava came along, we brought her with us to many of them. Now that we have Evan, I know I need to start planning a trip for our new foursome. I’ve just not decided where yet. But I do know that we need to continue to show our kids this beautiful, endearing planet. Texas is pretty great, and there is a lot here we have yet to see, but beyond this great state and beyond the U.S. is calling our names. Aside from our own experiences of different locations, cultures and scenery, I have another motive for travel. I want to find my home. I have yet to find a place that draws me in enough to commit to relocating. But there are some hefty contenders. Paris is incredible, but the congestion and overpriced housing there are huge barriers. Oahu and Kauai felt almost like home to us, but again, the overcrowding and prices keep us away. Southern Germany was one of the prettiest places I’ve been, but immigrating over there is extremely complicated. What I do know is that I need an ocean, and maybe some mountains. While I have traveled a lot in my life so far, I’m far from finished, and I will keep traveling with my family until we find the place that fits.